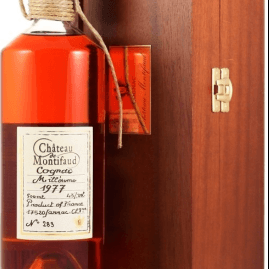 A very rare 1977 Vintage Cognac from Chateau Montifaud and we will add a Birthday gift card, Anniversary card and many more. The vintage years are equally interesting in their diversity thanks to the year but also to the method of making. Thus, certain vintage years are aged in Tronçais type oak in order to obtain a particular characteristic and, therefore the different qualities of our blended cognacs. Chateau Montifaud wines are stored with their sediment for better keeping, particularly to prevent oxidation. No anti-oxidizing agent is ever added to our wine, the high level of acidity alone allows a good keeping of the wine up to distillation.